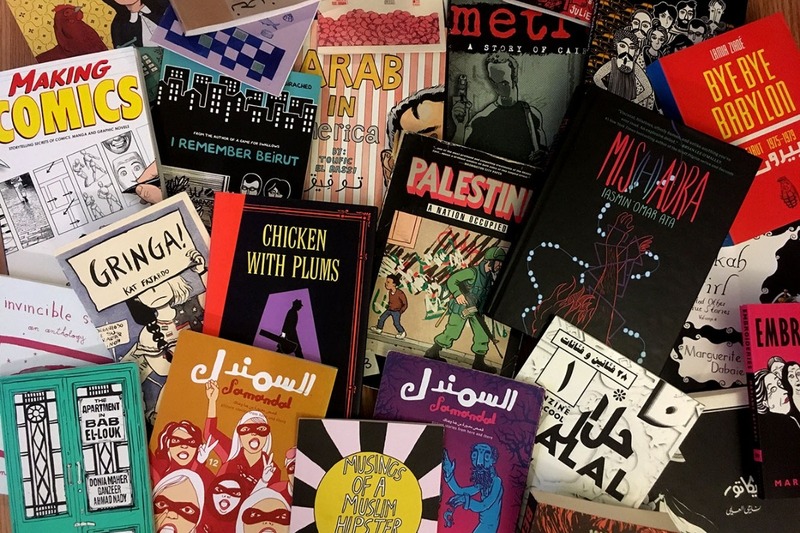 Up to ten artists of Middle Eastern or North African origin living in the Detroit/Dearborn metro area will participate an eight-week comics workshop led by Palestinian graphic novelist Leila Abdelrazaq and Lebanese artist and designer Aya Krisht, in partnership with the Arab American National Museum. We have recently closed applications and are beyond excited at the diverse and creative range of applicants from all ages and experience levels, and are so thrilled to be able to bring this FREE workshop to them and foster their knowledge and skill to tell their stories through comics. We are raising money for printing stipends and art supplies for the selected artists, travel stipends to ensure selected artists have access to the workshop location (Dearborn City Hall Artspace Lofts ), and fair compensation for our teaching artists labor. The workshop will mark the transition of Leila's distro and blog, Bigmouth Press & Comix , into a small press publishing house, Maamoul Press. Selected artists will create their own 8-16 page autobiographical short comics and self-publish them in the form of a zine . The artists will then have the opportunity to share and sell their work at the Arab American National Museum’s (AANM’s) Second Annual Arab Print and Book Festival this spring. Workshop sessions will be held for three hours every Saturday morning at the Dearborn City Hall Artspace Lofts as part of Leila Abdelrazaq’s residency at the lofts, which will be hosted by the AANM. Participants will have access to open studio time on Saturdays following the workshop, as well as to Leila and Aya’s comics and zine library, which will be housed there. Workshop will go from 9 AM until noon, followed by optional open studio time between 1-5 PM. Leila Abdelrazaq is a Detroit-based Palestinian author and artist. Her debut graphic novel, Baddawi (Just World Books 2015) was shortlisted for the 2015 Palestine Book Awards and has been translated into three languages. She is also the author and Illustrator of The Opening (Tosh Fesh, 2017) as well as a number of zines and short comics. Her creative work primarily explores issues related to diaspora, refugees, history, memory, and borders. Leila has been involved in organizing in various capacities since 2011, and integrates art making into her organizing work. She is also the founder of the small press and comics distributor Bigmouth Press & Comix. In the past, she has taught a number of multi-week classes in comics and illustration at Spudnik Press in Chicago. Aya Krisht is a Lebanese designer and printmaker currently based in Dearborn, MI. She graduated from the American University of Beirut with a BFA in Graphic Design, where her senior thesis focused on the relationship between design and comics. She has been a speaker on multiple panels and presentations about comics. She is the Media Designer at the Arab American National Museum where she manages all of the print and digital visual applications of the Museum and its events and projects. She is also a member of the Jamaa Al-Yad artist collective which engages in the global fight for equality and justice through art and printmaking. Her linocut print “Love & Death” series was selected as one of the Best Hundred Arabic Posters for 2018 and will be exhibited in Abu Dhabi and Cairo in the coming months.